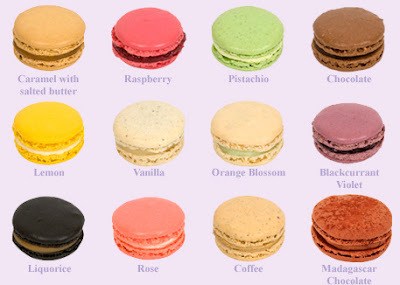 Some of the macaroon flavors offered by Laduree. Photo from Laduree.fr. Ladurée opened their first shop in the United States a couple of weeks ago, in Manhattan on Madison Avenue at 71st Street. I’ve read the lines are kind of crazy right now with people wanting to get their hands on their famous macarons flown in from Paris. I plan on making the trek to try them myself, having never had them before. Ladurée New York offers them in 15 favors for $2.70 each. Before I can get there I will have to enjoy the macarons from Almondine, a patisserie that is a block from my house. Almondine makes them in black currant, lemon, pistachio, vanilla, coffee, raspberry, and, my absolute favorite, passionfruit. Yes, please! Until I get to Ladurée I will enjoy the macarons from my local patisserie Almondine. Top to bottom: pistachio, lemon, passionfruit. I plan on having a Macaron Smackdown once I get a hold of a few from Ladurée but a friend of mine assures me Ladurée will win any taste test I stage. I will get back to you with the results! I've never had a Lauduree macaron, but I have stared at them many times while in Paris. I did try Gerard Mulot macarons during my last visit to Paris. I love to look at them and love the idea of macarons, but I have to confess that my taste buds are not crazy about them. I find them way too sweet. Hi Sacramento, I will be enjoying the passionfruit macarons from my local patisserie until I can make it to Laduree. I had one tonight, they really are good. Hi Adrienne, when I went to Paris in 1999 my husband and I spent so much time going to museums and Versailles that we missed out on the Laduree experience. Now of course, if I make it back to Paris, Laduree is high on my list of places to visit. It's interesting to me that they are flying these macarons in from Paris and I would love to talk to a connoisseur to find out if the macarons are not as good because of being transported overseas. I'm with you, I can take a hit of sugar, so like one macaron, but not a plate of them. These have been talked about so much that I will of course give them a try, but I'm sure I will go right back to my favorite recent indulgence, Lindt dark chocolate truffles. And then, only one! Hm, do you suppose they'll ship to the midwest? There are several flavors I'd like to sample. I just admire how pretty and delicate they look. food=art, lol. The flavours would get me immediately, black currant, rose, coffee. oooh, COFFEE! I did not expect them to ship their goods but rather a chef who fabricates them in New York? There is a famous patisserie in Vienna which fabricates macaroons, too. I never fell for them, probably because all the other stuff they sell is so delicious. It was cottonsocks blog that made me take a second look. I am curious..what makes them so much better? Secrets that make me hungry. Hi Terri, when I go I am going to ask if they will ship. Otherwise maybe I can ship some to you! What flavors are you interested in? Hi Fashion Tales, thanks for stopping by again! I'm with you I'd love to try rose, black currant, probably lemon too. As for coffee, I love the drink but don't normally like coffee-flavored treats, though of course I might have to make an exception in this case! Hi Paula, how are you? I need to go to your blog and see what you are up to. I was surprised to find out the macarons are being flown in from Paris, I too thought they'd be made in New York. Interesting. I'd love to be with a Laduree connoisseur who could tell me if there is a taste difference! Hi Bella, I don't know what makes Laduree macarons so special, but I intend to find out! Then we can add that to places to visit next time you are in town. I hope that will be February 2012! Hi Paula, I loved the picture of you in your recent post and thank you for sharing photos of Vienna. I want to learn more about that city now!